education and/or their career of choice (APEX Brief, 2007). skills for employment in the industry. accreditation became part of these technical trainings. 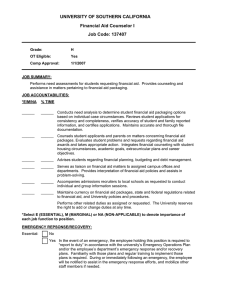 Career Counseling Management developed in September 2008.
toward that “career of choice”. training and implementing the career counseling program. building, and not just any relationship, but a helping relationship. and as a prelude to decision making (CHED-UP, 2007). realistic appraisals of both its strengths and weaknesses. students are faced with and in which a career counselor could be of assistance. 2. They must achieve in peer relationships a new level of closeness and trust. characterized by independence and responsibility. and become confident to look toward to one’s own place in the “career world of adults”. considered as this can promote or hinder sound career decisions of the student. decision. In any of these instances, people hold an idea of who could best be a counselor. how competent that person is to handle the role expectations. purposes of this manual, ‘career counselor’ would be adopted. which are already being expected of and fulfilled in some APEX schools. Adventures for Lifelong Learning) projects. special cases, may seek more appropriate intervention. Examination) is an example of these tasks. or scholarships, military service, internships, on-the-job training and job placements. in complement to the existing school curriculum and schedules. Given these expectations, what should the career counselor possess? The Republic Act No. counseling and have five (5) years experience as full-time guidance counselors. Group Process and Program Development. in the client is minimal regardless of the techniques employed. relationships in the school community. and work toward the resolution or a clear plan of action. Figure 1: Schematic Overview of the Counseling Process (WHO, 2008). career counselor and the counselee (student). the counselor as the ‘helper’ and the counselee as the ‘helpee’. feelings as he hears them repeated by another person. issues that are most important to them—not those considered important by the counselor. eventually recognize alternative ways of thinking that will promote personal growth. assumption is that each person can change what goes on in their mind. Cognitive approaches focus on the present and the resolution in the present, for the present. difficulty in the present and work toward a solution for the present. on the capacity of the counselee to effect the change in his cognitive or thinking processes. approaches, the most popular is the Rational Emotive Behavior Therapy or REBT. counselor should look first into the A-B-C of personality. misses classes and considers dropping out of school. that is, that you have lots of other possibilities? can start to think that he has the choice on how to react to one failure. belief with a new set of healthier thoughts and feelings. through the process of social discourse or dialogue. Knowledge is sustained by continuous social processes. Knowledge is co-created. A person creates and imposes meaning on the world. He is a knowledge creator. the process of discourse with the counselor. And as the counselee has the capacity to cocreate this reality, he also has the potential to create solutions. the problem and its solution. problem and state it in a positive form. already working and to achieve the desired goal or future. who are relatively free to care for her brother while she goes to school. or the counselee who is the expert regarding the problem. meaning in the change process (Brott, 2001). motivations, the people in the stories, his role in these stories. and imagines different life roles. and the results are interwoven in the life story of the counselee. 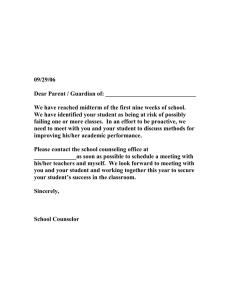 counselor comes from, may be modified as appropriate. 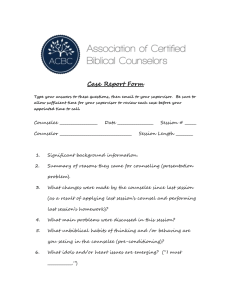 and a separate intake form be filled out when a student reports for a counseling session. session. In the school setting, that person who usually makes the appointment is the parent. 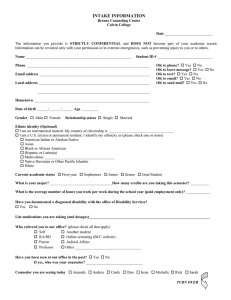 The reason for the referral has to be noted in the intake form. 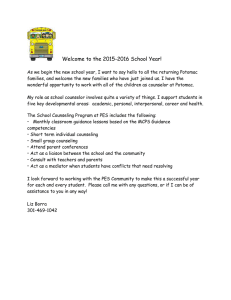 counselor to create an environment of trust and acceptance for the counselee or student. session as most often the presenting problem or concern may not be the “real concern”. be finalized at this step. result is a heightened awareness of the counselee or student of himself. counselor also assists the counselee to explore other areas that may need his awareness. steps particularly for similar situations that he may encounter in the future. “assignment” that he could do without the benefit of counseling intervention. and is no longer part of the student population being served, a referral may be put in place. able to recognize his capacity and responsibility for personal growth and maturity. with, “Are you saying you do not like everything in the school or just some aspects of it?”. counselee or student to have a more thorough examination of his feelings and thoughts. of the shared experience, feelings or thoughts. is already “alerted” with a dominant theme of which core is still hidden. but sincerely recognizing what is positive in the person of the counselee. of the Rogerian or person-centered approaches. interview e.g. research, job selection, medical, etc. (Kidd, 1996). between the goals, feedback and response e.g. biases, beliefs, etc. Source: Millar, et.al. (1992) as cited in Kidd (1996). or these could be the very conditions where the interview is being conducted (e.g. wellventilated private office, noisy hall, etc.). empowering him to make his decisions (Campbell, 2000). what people are capable of and in advising them for the professions. types of questions and give highly correlated results. measures how well a student can meet the demands of military training or university study. from high school that makes the student “suitable” for certain fields or courses. Education and Skills Development Authority (TESDA). personality types or worse, stereotypes. interaction with the environment” (Atkinson, et.al., 1990). for personality assessment, require specific protocols for administration and interpretation. standardized aptitude and achievement tests are subjected to. The most common of these inventories are the Strong Interest Inventory, GuilfordZimmerman Interest Inventory, and the Kuder Preference Record. Derivations on J.L. and conventional) are also widely developed by private organizations. those jobs or occupations where their values are realized. the counselee interacts with the counselor or with other participants in a group session. the genogram, life-space diagram, and family floor plan (Tanalega, 1994). patterns or themes you discovered in your family? boxes affecting your performance in school? performance in school (e.g. bingo, regular parties)? handle, a referral could be arranged. career changes. This technique could be used nonetheless, in a school setting. measures can we put in place to ascertain that our intervention was worth the effort? 2. Use interventions that are evidence based (Carey & Dimmitt, 2006). activities (Steen & Kaffenberger, 2007; Studer, Oberman, & Womack, 2006). improvement and to inform their practice (Rowell, 2006). in the earlier stages of setting up the career counseling center. review how these services were determined, implemented, and reviewed. they explore the vast fields of occupations. Two important considerations need to be made in developing a career-counseling program. and can be conducted more effectively. 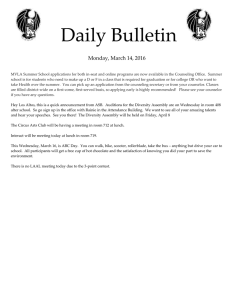 vocational interests, career planning and career choice. The proposed system is based on the set underlying basic assumptions. 1. Career and its implementation is a developmental process. relevant factors to be considered in decision-making. accepting responsibility for their decisions. their own community and in the country. aware of their strengths and weaknesses, and (c) top reflect more positive interests. 1. Identify student needs and establishing program goals and priorities. 2. Translate goals into specific behavioral objectives. 3. Specify processes and methods. 4. Plan, implement and evaluate process. their parents, etc. This instrument can also be used to identify potential dropouts. as the suggested form appearing as Appendix A.
rate of students during the past year was 25%. or choice of a vocational-technical course, or to seek available employment. Priority 2. The dropout rate should be reduced. objectives provide the guides for the following phases. school year should be able to state their plans after graduation. specific terms, the steps they will undertake to implement their plans. of the Post-test from (see Appendix D) to be administered later in Phase 5.
phase, the support of the school administration is both necessary and urgent. resistance by other teachers to certain procedures, may arise. one as the method to be implemented on the trial basis. school administrators, teachers, parents, students and other segments of the community. implementation; and, if possible, take some sample measurements of the outcome criteria. planned for. Undesirable consequences should also be noted. objectives formulated in the previous steps. 1. Are teachers introducing career information in their class? 3. How do students show interest in gathering career information? 2. Minimum and desirable levels of student behavior as defined in previous steps. Do you think there is some advantage to having career plans? Why? What plans have you made for your future? What do you have made for your future? What do you plan to do for the first year after graduation from high school? What do you need to do first in order to implement your palm? the systems approach seems to have considerable potential. particularly when exceptional assignments are given out. should be able to communicate well with everyone above you, below you and beside you. Remember that professionalism also includes how others perceive your behavior. that respect is earned by your conduct as well as your track record. kid on the block. Give yourself time to adjust to your new life. abilities, aptitudes, other abilities and skills, motivation, personal values). skills, in what TVET, HEI or SUC and where are their locations, tuition and fees. advancement opportunities (where and at what level); potential income; etc. in need of these occupations and at which levels. competent guidance staff with professional training in career guidance. to implement while others require a greater investment of time and/or financial resources. provides career assistance to students. Videos. Videos can be made available on various career topics for students to watch. and learn what went well and what needs to be altered in their behavior. incorporating formal or informal assessments into career programming. available. These resources can also be accessed through CD ROM or the Internet. many resources available in the web that students and teachers can easily access. 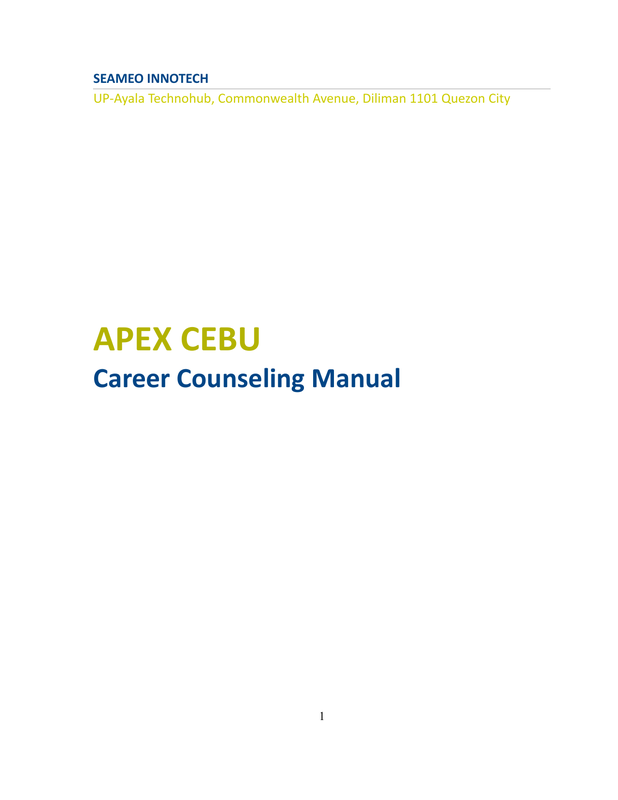 This section of the manual aims at assisting the APEX student in exploring career options. areas that could be improved so that he could move closer to the desired image. through a guided and informed decision making process. A. WHAT IS A “CAREER”? conception of what constitutes a career. are therefore, more receptive to the concept of changing jobs or organizations. more prevalent at present than before. strengths, values, and interests are developed and contributed along the way. example, take on a career that is hinged on the pursuit of expression of aesthetic interests. may or may not receive renumeration for such services. independent business ventures. Either way, a career provides a means to achieve life's goals. as a contributor to society. some will have to be let go. What are the career/job goals you now are considering? Who or what helped you learn about your choices? Who or what has had the greatest influence on your career decisions? What do you think are the barriers to achieving your employment goals? one's learning style can help in maximizing a learning experience. thinking, feeling and intuition. Sensation is the reality function – it tells that something is. in the object. Intuition and sensation are conflicting modes of perceiving the world. feelings and process reflectively by observation. and feelings and process actively by doing. Has tendency to derive information through direct, hands-on experience. Draw a dotted line down through all the boxes, starting with your highest letter score. in the box indicates the most preferred learning style. were no checks in any one group, leave the column bar blank. the job category associated with that letter from the above list. many of the checked activities as possible. the job category listed with that letter above. a. Compile a short dictionary for financial reward. b. Write a short story for fun. a. Going to evening class to improve your qualifications. b. Going to evening class for fun. a. Improving a sporting skill by playing a game. b. Improving it through systematic practice. a. Work that earns promotion. b. Work that you enjoy doing. b. Doing things on the spur of a moment. a. Going to formal evening meetings. b. Watching television for entertainment. a. Investing money in a long-term insurance or pension scheme. b. Buying an expensive car. a. Spending $200 having an enjoyable weekend. b. Spending $200 repaying a loan. b. Living life as it comes. a. Always trying to finish your work before you enjoy yourself. b. Frequently going out for enjoyment before all your work is finished. a. Not needing to explain your behavior. b. Having purposes for your behavior. b. Taking each day as it comes. a. Leisure activities which are just exciting. b. Leisure activities which have a purpose. a. Spending one's life in many different places. b. Spending most of one's life in one place. a. Having your tasks set for you. b. Choosing your own activities. a. Staying in one job. b. Having many changes of job. a. Seldom doing things for “kicks”. b. Often doing things for “kicks”. a. Taking holidays in many different places. b. Taking holidays always in the same place. a. Frequently trying strange foods. b. Always eating familiar foods. a. Recounting an incident accurately. a. Having continuity in the place where you live. b. Having frequent moves of house. b. Going through life safely. a. Winning a game easily. b. Playing a game with very close scores. a. Steady routine in life. b. Continual unexpectedness or surprise. a. Working in the garden. a. Traveling a great deal in one's job. b. Working in one office or workshop. a. Going to a party. b. Going to a meeting. a. Going away on holiday for two weeks. b. Given two weeks of free time finishing a needed improvement at home. a. Going to an art gallery to enjoy the exhibits. b. To learn about the exhibits. a. Eating special things because you enjoy them. b. Eating special things because they are good for your health. a. Climbing a mountain to try to save someone. b. Climbing a mountain for pleasure. a. Happy to waste time. b. Always having to be busy. a. Watching a crucial match between two ordinary teams. b. Watching an exhibition game with star performers. a. Glancing at pictures in a book. b. Arguing with others seriously to change their opinions. b. Playing a game for fun. SCORING THE SCALE. To find your score, compare your answers to those on the scoring key. through 28, and questions 29 through 42.
in your job preference. Look at your own score and compare each to the job requirements. match those needed in your vocational or career preference. success (even at the sacrifice of present rewards) fit with high levels of planning orientation. you are oriented toward goals which you see as important to yourself or those close to you. High scorers tend to be business- or work-oriented rather than into activities just for fun. that primarily involve intellectual tasks fit well with high levels of this trait. response (1-5) that best describes how often the belief guides your behavior. wrong answers. Your choices should describe your own values, not the values of others. A ______ ACHIEVEMENT It is important to challenge yourself and work hard to improve. B ______ BELONGING It is important to be accepted by others and to feel included. D ______ CONCERN FOR OTHERS The well-being of others is important. E ______ CREATIVITY It is important to have new ideas or to create new things. G ______ HEALTH AND ACTIVITY It is important to be healthy and physically active. H ______ HUMILITY It is important to be humble and modest about your accomplishments. I ______ INDEPENDENCE It is important to make your own decisions and do things your way. expectations of your family or group. K ______ PRIVACY It is important to have time alone. L ______ RESPONSIBLITY It is important to be dependable and trustworthy. part of something greater than yourself. 10th ed. Orlando, FL: Harcourt Brace Jovanovich Publishers. Counseling, 01 August, 2009. Retrieved from http://thefreelibrary.com. research to work. Hoboken, NJ: John Wiley & Sons, Inc.
Campbell, V.L. (Eds.) (2000). Testing and Assessment in Counseling Practice, 2nd ed. Mahwah, NJ: Lawrence Erlbaum Assoicates, Inc.
Cochran, L. (1997). Career counseling: a narrative approach. Thousand Oaks, CA: SAGE. and the American School Counselor Association (ASCA). Cottone, R. (2001). 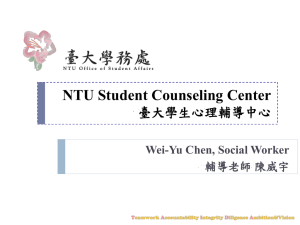 A social constructivism model of ethical decision-making in counseling. Journal of Counseling and Development, 79, 39-45. Curriculum Development (ASCD). 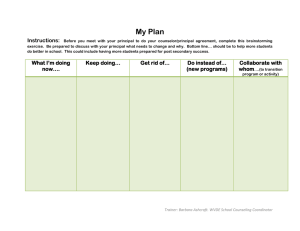 Retrieved from http://www.ascd.org. Evangelista, L.L. (2005). 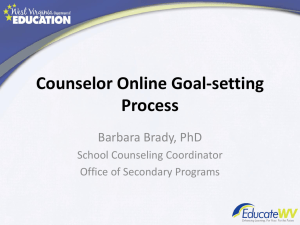 Introduction to Guidance and Counseling. Copyright by the author. Published by Booklore Publishing Corp.
Journal of Extension, 44 (3). and high school students (Effective techniques). Career Development Quarterly, June 2005. April 1, 2010. Retrieved from http://www.thefreelibrary.com. McLeod, J. (1996). The emerging narrative approach to counseling and psychotherapy. Takasaki City University of Economics, 49 (2), 17 – 30. Nathan, R. and Hill, L. (2006). Career Counselling. London: SAGE. (2004). Career Guidance: A Handbook for Policy Makers. Paris: OECD Publications. psychology. Mahwah, NJ: Lawrence Erlbaum Associates, Inc.
theory and practice. Rotterdam, The Netherlands: Sense Publishers. Careers. Journal of Vocational Behavior, 51, 358-374. doi: 10.1006/jvbe.1996.1544. Studies. Thousand Oaks, CA: SAGE. Ugnayan at Tulong Para sa Maralitang Pamilya (UGAT) Foundation, Inc.
Quezon City: Ugnayan at Tulong Para sa Maralitang Pamilya (UGAT) Foundation, Inc.
Poor). Copyright by the authors. Published by the Don Bosco Press Inc.
for adolescents of divorce. Professional School Counseling, 1.
counseling services in higher education settings. Paris: UNESCO. and practice. Mahwah, NJ: Lawrence Erlbaum Associates Inc.
Watts, A.G. (1996). Rethinking careers education and guidance: Theory, policy and practice. WHO (2008). Counselling for Maternal and Newborn Health: A handbook for building skills. World Health Organization Department of Making Pregnancy Safer (WHO/MPS).